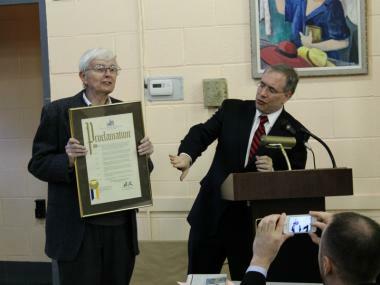 Manhattan Borough President Scott Stringer, left, hands departing CB4 member Ed Kirkland a plaque declaring April 4, 2012, "Ed Kirkland Appreciation Day." CHELSEA — Eleven people joined Community Board 4 last week — the most new members of any community board in Manhattan. The new members come from all walks of life, including an analyst for the Fire Department, an award-winning documentary filmmaker, two retirees and an employee of the city's hotel workers' union. "It's a wonderful, diverse group, and I look forward to working with them on a variety of issues," said Manhattan Borough President Scott Stringer at a CB4 meeting this past Wednesday. "One of the great things about this board is that there is never, never enough issues to tackle — and enough different opinions." The fresh-faced crop of new members have a busy year ahead of them, as the ongoing battle over a proposed expansion of Chelsea Market will loom large over the board for the next few months. Community Board 4 members applaud Ed Kirkland, left, who's been on the board since 1982. Tina DiFeliciantonio, 50, is an Emmy- and Sundance-award-winning filmmaker at Naked Eye Productions. Her films tackle subjects including teen sexuality, AIDS, torture and LGBT civil rights, and she said she's looking forward to being a force for social justice on the board. "I've always been interested in justice, in doing what I really think is important, to listen to all sides," said DiFeliciantonio. "I'm interested in learning about different aspects of the community — what the issues are, not just what I think the issues are." Bruce MacAffer, 47, comes to the board with an advertising background at WPP Group USA, along with a history of advocacy for the 7 train extension. "I'm very interested in land use issues in our community," he said. "I’m very interested in supporting the arts, and not have them be crowded out by a lot that’s going on." Not all of the new board members live in the district. Miranda Nelson, 26, was born and raised in Brooklyn — and still lives there — but works for the New York Hotel Trades Council, which is located in the district. "I'm really interested in making sure the community has a voice in development, especially all the big developments coming here," she said. Other new members include Elizabeth Zechella, an editor at the Metropolitan Museum of Art; David Warren, a staff analyst for the Fire Department; Katherine Consuelo-Johnson, an active parent at P.S. 51 on the Upper East Side; attorney Frank Holozubiec; retired teacher Charles Bayor; retiree Aldona McCarthy; Democratic club activist Khemray Singh; and equity trader Delores Rubin. On top of all the new members, the board also lost one of its longest-serving members; 86-year-old Ed Kirkland, who joined the board in 1982, stepped down last week. "Ed will go down in history as one of the best and most important community board members in the city," said Stringer, who also declared this past Wednesday to be "Ed Kirkland Appreciation Day." The longtime board member played an important role in just about every land use and preservation decision in the district, including the creation of Hudson River Park. "It's time. I know it's time. And I'd like to thank all of you with who I've worked," Kirkland said. The longtime member won't entirely disappear from the board. He'll still be a public member of the Chelsea Preservation and Planning and Landmarks Committee for the foreseeable future.